Mark Moseley and myself fished Werribee River K Road cliffs. The conditions were perfect. 5 minutes into our session we were interrupted by a bent rod and screaming reel. I knew straight away this was a good size fish as it was continually taking line of the spool. I landed a very healthy 35cm Bream. An hour passed until once again my rod took off. This time the fish was very keen to hide for cover in the safety of the nearby reeds. I landed a very thick 36cm Bream. 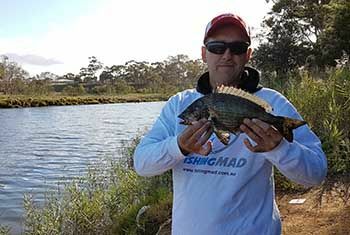 Again right on the hour Marks rod went off giving him a decent battle was a 36cm Bream which was landed safelty.